Low-cost airline easyJet has welcomed the jailing of an abusive passenger who punched cabin crew in a homophobic attack. Michael Cunnett and his wife were sitting on plane at Gatwick waiting to fly to Egypt for their honeymoon when he decided to try and smoke his e-cigarette, a court heard yesterday. When politely asked to stop by airline crew he became aggressive and started attacking staff and shouting homophobic slurs. Two members of air crew were injured in the nasty assault, in which Cunnett was swearing and calling people 'queer'. Cunnett, 38, of Tonstall Road in Epsom, had drunk four pints of Stella before getting on the flight, the court heard. 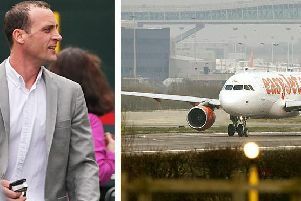 Following the court hearing, a spokesman for easyJet said: “easyJet is pleased that the court has realised the seriousness of the offence which is reflected in the custodial sentence that has been imposed. “Whilst they are rare, easyJet takes all incidents of disruptive behaviour very seriously. We have a duty to ensure the safety and wellbeing of all of our employees. Judge David Rennie said Cunnetts’ abusive attack was ‘absolutely disgraceful behaviour’ and ‘like a child having a tantrum’. He said: “We do have to ask what airports are doing selling alcohol at that time of the morning.